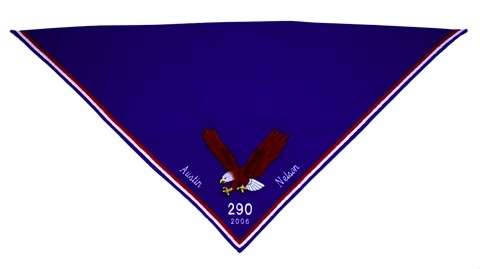 Eagle neckerchiefs are made of the finest quality trigger material of 65% polyester and 35% combed fortrel cotton. They are trimmed with 3/4 inch woven braid and are 100% embroidered designs (no patches are used). We offer custom personalization of name, unit number, and year. Two styles are available. One with a full eagle, the other with an eagle head. If picking up shipping charges will be reimbursed. Reimbursement can be done through PayPal or at the Open Aire shop when picking up. 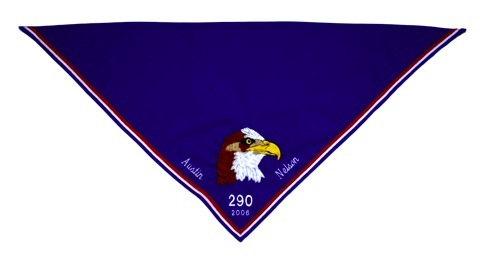 To order, please click on the desired neckerchief and you will be taken to the order page where you can personalize your neckerchief. 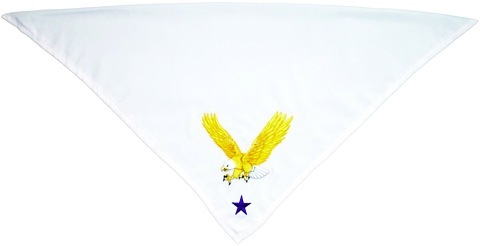 Mother/Grandmother Eagle neckerchiefs are made of 100% polyester "silky" material, fully embroidered with blue stars designating sons, a red star designating husband, and gold stars designating grandsons.